If you’re looking for a welder in the Bourne and Lincolnshire area and don’t want to pay extortionate amounts of money, we are delighted to be able to offer our customers here in Bourne a range of welding services for your vehicles. You will not need to worry about your car being in for longer than it needs too or be talked into having unnecessary mechanical work, and we guarantee that you will receive a friendly, honest and highly professional service at an affordable price. We know a thing or two when it comes to vehicle restoration with car welding so you can take real confidence that you’re in safe hands with us. Rust is less prevalent in newer vehicles but can still cause MOT failure. 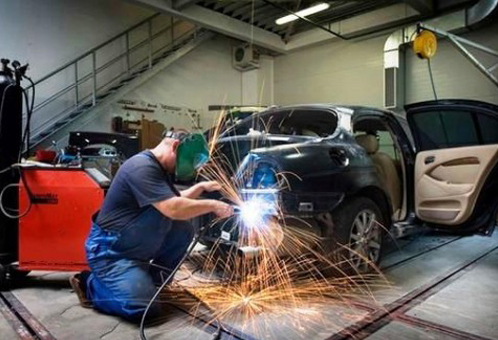 Welding is also one of the most competent methods to carry out automotive repairs, particularly on old cars. Welding is a demanding and highly skilled trade which requires complete care and strict adherence to safety regulations. We take great care when welding near the fuel line, fuel tank, and paintwork and always use a surge protector to safeguard your vehicle's electronics. We have all the necessary equipment to carry out high-quality vehicle repair work using the latest in welding equipment. Sculpting the affected area using heat to join and fuse back together. Welding is the most efficient way to connect components permanently and is a safer way to carry out repairs. Prices will depend on the scale of the job so we always advise our customers to bring their vehicle in so we can carry out a visual check and provide you with a highly competitive quote. Can you provide me with a quote without seeing my vehicle? We are not comfortable doing this so highly recommend you bring your vehicle to us so we can carry out a visual check. What happens once we agree on a price? We will agree on a timescale and a date for you to bring your vehicle into us at a time convenient to you. Is there a limit on the size of job you can do? We have no limit and will always do our very best to accommodate you. Give us a call on 01778 393 888. We value the safety of all our customers, and It is vitally necessary to ensure that all parts underneath your vehicle including fuel lines, joints, chassis and exhaust pipes are sufficiently safe and secure to ensure these components do not break and fall off. Here at Bourne Car & Van Hire, we take immense pride in the work we carry out and are more than happy to explain what action is required and the reasons behind why it needs to be undertaken. It is extremely important to us that the customer fully understands what the work will involve and how it will be resolved. We are straight talking, professional and honest so why not give us a call today on 01778 393 888.